The Priest-san. Samurai's confession film based on priest and actor Ivan Okhlobystin's scenario has been released. 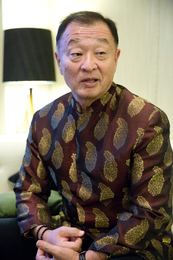 Renowned American actor of Japanese origin Cary-Hiroyuki Tagawa played the leading role in the movie. He played the part of an Orthodox priest and adopted Orthodoxy after participating in the movie. He tells how he got acquainted with Russia and Orthodoxy in his interview with Interfax-Religion's correspondent Polina Frolova. - Your role of an Orthodox Japanese priest has become unexpected. You were not Orthodox before participating in the film as you have lived in America since you were five. - As far as the role is concerned, it was unexpected, but at the same time long-awaited. I mostly played 'bad guys' in Hollywood. I had to represent a true Christian in the film offered by producer Lyubov Kalinskaya on scenario of my new friend Ivan Okhlobystin. It was really difficult and it is a big responsibility. I know the teaching of Jesus Christ since I was a child, my mother, a Japanese by origin, took us to the Christian American Church to make us understand the culture and religion of the country we live in. - How did you get acquainted with Russia and Orthodoxy? - I first visited Russia in 2001. I've been here seven or eight times. But only after participating in the Russian movie Priest-san. Samurai's Confession I understood what is 'Mother-Russia'. We lived at the country, talked to ordinary people. I was very inspired and impressed to see how strong and firm you, Russian people, are. True warriors. I feel that I am connected with Mother-Russia at some deep level and I want to be its part. I decided to become Orthodox not long ago. But I was thinking about it for a long time, I was trying to find my own way all my life, my place in the world. When we came to America in my early childhood, we adopted Christianity. My brother and I attended a Sunday school in the USA. However, there is more form in American Christianity. And I was looking for the content. Nowhere else I managed to find the depth of the Orthodox faith. Only now when I am 65 I feel that I managed to find my right place. Formally, I made my choice not long ago, but it took all my life to come up to it. - You decided to baptize in Orthodox faith, head of the Synodal Department for External Church Relations, Metropolitan Hilarion of Volokolamsk baptized you in the Church of The Icon of Mother of God Joy of All who Sorrow with the name Panteleimon. Why did you choose this saint as your heavenly protector? - I was very serious about the choice and made it with great responsibility. I was a healer before I started playing in Hollywood movies actively. I still have my own respiratory practice which helps to recover and return vital tone. Saint Panteleimon who cured people with God's name and helped them cope with their troubles inspired me very much. I understood that physical recovery is possible only if you are spiritually healthy. There is no other way. Such spiritual recovery is impossible outside the Church, without faith. - At the shooting area you got acquainted with Russian actors Ivan Okhlibystin and Pyotr Mamonov. What impressions do you have from communicating with them? - Russian people impress me with their depth. They differ from the American model of thinking I get used to. Russian and Japanese people have very close spiritual foundations, our hearts are similar. The reason of it is in your history, your culture focuses on human soul. There is no such things in American culture. When I say it, I don't want to offend Americans. They are also very good people. But it is impossible to become people with a truly deep soul for 400 years. I was surprised to learn that Ivan Okhlobystin is a priest. I understand that a Russian person is so multifaceted and unlimited that I want to become as close as possible to this culture. - What holy places did you manage to visit during participating in the movie and its presentation? - I managed to visit New Jerusalem and it impressed me much. I saw with my own eyes how important for a Russian person are holy shrines, how deeply you respect your faith. Now I understand why the whole world respects the Russian people. People with such a heart and such a soul cannot, but cause admiration. I wish you always be yourself, be faithful to your culture and Orthodoxy, it makes you extremely strong people.